Meet Little Ray. She might be an eyesore of our small rental house, but she can do extraordinary things. 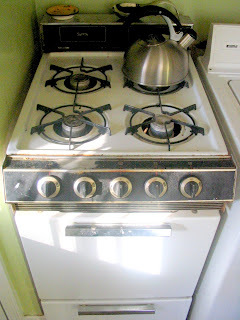 Originally, this little Sunray stove/oven was going to be THE reason I would not rent our house. The hideous kitchen wallpaper could be torn down, walls in multiple rooms could be painted, I could create some storage solutions to offset the teenytiny closets...even the mosaic broken-tile floor in the kitchen could be a silver lining: you never know when it's dirty! But the Sunray. I mean, cmon. You're kidding, right? Are you sure that someone just didn't stick a Sunray sticker on top of the original brand name: EasyBake Oven? Nevertheless, the house was charming and (more importantly) the rent was an offer I couldn't afford to refuse. Thus a friendship began between Little Ray and me. The regular size nonstick cookie sheets had to go. This little girl can only handle the little jellyroll pans. Have no fear, though--casserole dishes are good to go. One of the first things I did when I moved in was to give Little Ray a thorough (and maybe her first) cleaning. I rolled up my sleeves, donned the heavy duty rubber gloves and made her all clean and shiny on inside--that's what counts for all of us, right? When you see the dirty inner secrets of a friend, it can either drive you apart or solidify a bond. I'm happy to say that Little Ray and I experienced the former. While I ran my yearly half marathon last week, Little Ray had her own marathon of sorts approaching: our Bridgebuilders Sunday School class Annual Cookie Exchange. I personally was a little worried if she (and I) would be able to endure, but I should have known that she's one tough cookie (pun only slightly intended)! On Wednesday, over the course of several hours, Little Ray and I cranked out one hundred and twenty cookies...EIGHT COOKIES AT A TIME. Slowly but surely, she never faltered. That Little Oven That Could just kept baking and baking. I gave her a good long rest yesterday. But she's still up and at 'em... preparing herself for tonight's task: Cider Pork Chops! Thanks, Little Ray, for the lessons you teach me every day about endurance and doing your best with what you have! at least both your washer and dryer are in your house! 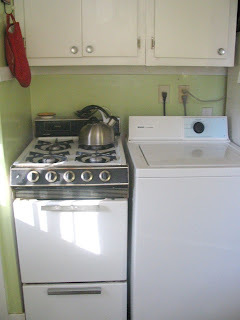 in our old house on whitewater (sniff) the washer was in the kitchen by the oven and the dryer was in the carport. who thought of that plan? But, the best was your packaging. You are very talented! Oh, by the way, do you have your 12 days of Christmas cookies planned out now after last night? So have you made the wheat germ cookies? Just curious what you thought. Little Ray sounds like a trooper. Well, I'm impressed by the endurance of Little Ray AND the cook who was bound and determined to complete those cookies. You make a good team...and good cookies! Tesney, I did use your famous cookies and I'm hoping to blog about it soon! Everyone loved it, and I gave you credit on my recipe! Thanks for sending it! Hey, I can't believe I'm just now reading this. Little Ray? !